When I lived in Pittsburgh, I made a weekly habit of taking my children to a museum every Friday. Since my employment at the library got me into lots of museums for free, it was easy to do. But then I quit my job, moved to Salt Lake, and the kids grew up and went to school. Museum day fell by the wayside. Fast forward a few years — I decided to bring a little Katie into the world, and we moved to Seattle. Suddenly we have all these new museums to visit, and a little girl to share them with. Museum Day is back! So today: the Seattle Art Museum. I wasn’t able to take any pictures of the inside of the place, because Katie was so excited to be there that we dashed right by the sign showing the museum’s photography policy without reading it. Just rest assured that we saw lots of amazing Georgia O’Keefe paintings and painted thunderbird totem poles. 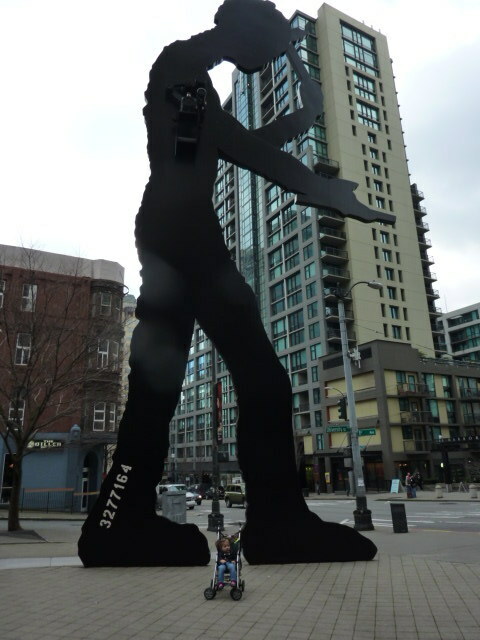 So here we are with Hammering Man, outside. And can I say how friendly people are downtown? I maneuvered my stroller to a door, and someone leaped forward to open it for me. I paused for a moment to look at at street sign, and a man in a suit immediately asked if I needed help getting around. Nice, right? I’ve read that Seattle had a reputation for courtesy, but it’s great to see it in action for myself. On the way there, we stopped at Soundbridge, the education space for the Seattle Symphony. They have a big room full of different instruments for kids to play. Katie was scared of the cello and double bass (too loud, maybe?) 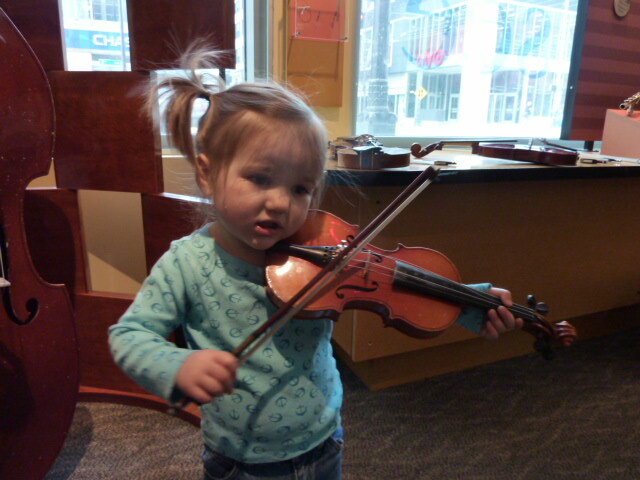 but she loved the 1/4-size violin. Cute, right? She was also a little too shy to play the xylophone for very long, but the red ukulele? She loved it so much I had to pry it out of her hands when it was time to go. Aww, so sweet! It makes me miss having a kid the right age to take her to museums weekly.